On March 19, Kazakh President Nursultan Nazarbayev resigned from office after nearly 30 years of undisputed rule as the leader of the oil-rich Central Asian state. The move was not unexpected, as Nazarbayev is 78 and in declining health. And the announcement itself came as a surprise for many. But there are already clear indications that the new regime will look very much like the old one. Nazarbayev’s departure marks a historic change. He was already First Secretary of the Kazakh Republic in 1989, when the country was still part of the Soviet Union, and became the first president of an independent Kazakhstan that rose from the ruins of the Soviet Union in 1991. For nearly 30 years he maintained an undisputed rule through re-elections and changes in the constitution up to the present day. In accordance with the Kazakh constitution, his successor is Senate speaker Kassym-Jomart Tokayev, who officially took power on March 20. Yet while he has given up his presidential title and invited a successor — a rare occurrence in post-Soviet states — Nazarbayev’s stepping down can be at best described as a cosmetic change. He maintains key functions that ensure full control over Kazakhstan’s political future — he is head of the all-powerful Security Council, and head of the ruling party Nur Otan. He also retains the title ‘Leader of the Nation’ for life, which grants him, and his family a lifetime of immunity from judicial scrutiny or prosecution. With a relatively small population of 18 million and substantial energy resources in oil and natural gas, Kazakhstan is considered one of the strongest economies in Central Asia. At the same time, deep socio-political divides between ethnic Kazakhs and ethnic Russians and distinct linguistic groups have generated significant social tension in the country. Other issues include the unequal distribution of energy resources to foreign investors and a limited economic elite, an increased presence of violent extremist groups, and a growing divide between rural and urban populations. The presence of imposing neighbours, namely Russia and China, raises important concerns as well. Both of these powers are major trade partners and investors in the Kazakh economy, and both expect certain things in return. China has demanded political allegiance on sensitive issues, including Kazakhstani silence about the fate of ethnic Uyghurs and Kazakhs currently detained in camps in China’s Xinjiang region. When it comes to political change, it is unlikely that a major opposition effort will emerge. Although there were significant voices of political opposition in the country in the early 1990s, heavy-handed measures of censorship and political control have decimated their presence. Today, most of the truly independent media reporting on Kazakhstan operates from abroad. When Mukhtar Ablyazov, one of the few prominent yet controversial leaders of the opposition wanted to share his views via YouTube on March 19, the internet was shut down across the country, perhaps due to the videos. Is Nazarbayev’s daughter next in line for power? Who will take control next? That is the question on everybody’s mind, inside and outside of the country. Possible scenarios about the beneficiary of the transfer of power abound, not the least because Kazakhstan is a highly patriarchal society where power tends to stay “in the family”. Nazarbayev has no sons but three daughters, Dariga, Dinara and Aliya. Dariga Nazarbayeva has been widely promoted in the public sphere as an influential media person and politician, and served as deputy prime minister in 2015-2016. One plausible future scenario is that Tokayev will call for elections in the coming months, allowing Nazarbayeva to run as a candidate for the ruling Nur Otan party. A candidate from the extended family or at least from the same political party will almost certainly emerge as the front-runner. Думаю, Дарига может стать президентом, несмотря на то, что она женщина. И несмотря на то, что у нее безусловно есть оппоненты в существующих в окружении Назарбаева кланах. Гарантию может дать только очень доверенный человек во власти.. эти персоны, конечно, в идеале должны быть из Семьи: дочь, племянник, зять. Именно поэтому Дарига стала сегодня спикером Сената – если вдруг что не так с Токаевым, она сразу подхватит выпавшее знамя власти. I think Dariga can become president, even though she is a woman, and despite the fact she certainly has opponents among the clans around Nazarbayev. What is important is that only a very trusted person within the power system can give guarantees to Nazarbayev…those people ideally should come from the family: a daughter, a nephew, a son-in-law. This is why Dariga was appointed speaker of the Senate today, in case Tokayev becomes unreliable, she can reclaim power. Some Kazakhs reacted to the transition with joy, while others expressed apathy, as the end game of the power transfer remains unclear. Сам по себе факт смены власти (пусть даже формальной) это позитивно, поскольку в стране три десятка лет не было вообще никакой смены власти. the mere fact of the transfer of power, even if informal, is positive, given that for three decades this country experienced no transfer of power of any kind. Yet there are also signs of strong rejection of the ongoing cult of personality surrounding Nazarbayev and his family. 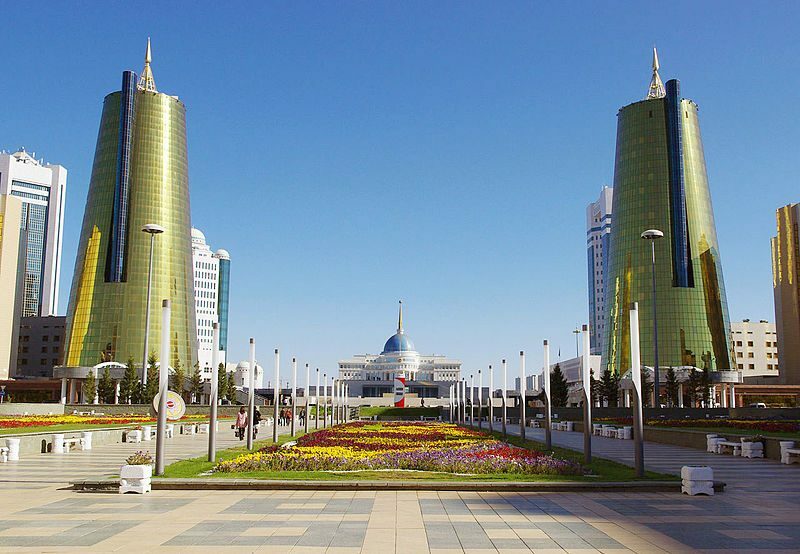 The new government was swift to announce as one of its first measures on March 20 that the capital city Astana will be renamed Nursultan, the first name of Nazarbayev. Nazarbayev himself moved the location of the capital from Almaty to Astana in 1997. On the same day, an online petition gathered more than 13,000 names to oppose this decision, a large number by Kazakh standards. Kyrgyz President Almazbek Atambayev and Kazakh counterpart Nursultan Nazarbayev during happier times. 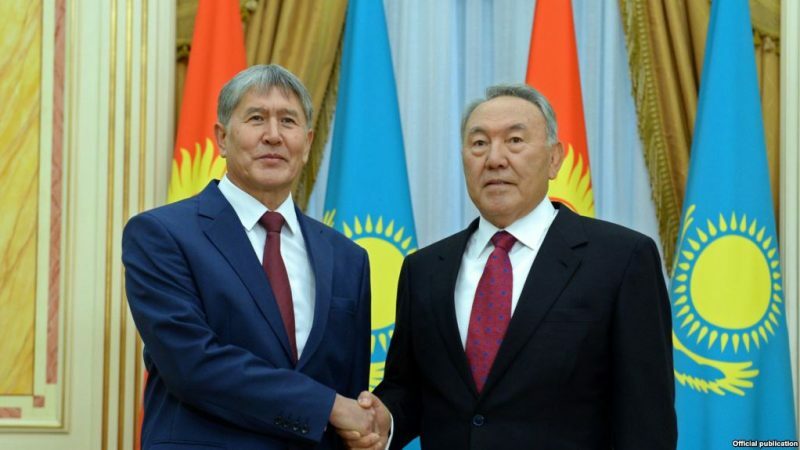 Photo from Kazakhstan’s presidential press service carried by RFE/RL. Neighboring countries are also paying close attention as this could indicate changes in foreign policy. There are also signs that Nazarbayev’s transition “method” could become a model in the region. Social media users in the Russian-language blogosphere speculated on whether the Nazarbayev model of transfer of power could become a model for Russia, where Vladimir Putin is losing popularity and has failed to designate a successor. On similar lines, in nearby Turkmenistan and Tajikistan, undisputed rulers Berdymukhammedov and Rakhmon are grooming their sons to take over their role in the future. In Kyrgyzstan the news of Nazarbayev’s resignation was more of a surprise – probably because we don’t really understand the mechanisms in place in that country. Nazarbayev saw how badly things ended for Karimov’s family after his death in Uzbekistan. That’s why the position of successors needs to be strengthened and power must be transferred to them while the leader is alive, to make sure they are obeyed, and then one can die.